Texas College Converts Football Field to Organic Farm. Is Nothing Sacred? 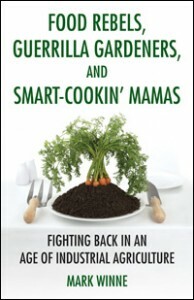 Mark Winne is the author of Food Rebels, Guerrilla Gardeners, and Smart-Cookin’ Mamas: Fighting Backin an Age of Industrial Agriculture. Highland Hills is one of those down-and-nearly-out communities that’s allowed a glimpse of prosperity but never gets to taste it. The Dallas skyline looms large and shining across the hazy north Texas horizon and is linked to this poverty-plagued neighborhood by a seven-mile ribbon of light-rail steel. Ledbetter Avenue crosses the train line passing by vacant buildings, vast stretches of empty parking lots, and a dizzying array of “For Sale,” “For Lease” and “For Jesus” signs. Named for the renowned guitar picker Lead Belly who did time in these parts – both in and out of prison – the Avenue speaks little in the way of promise, but wails the blues of poverty loud and clear. Like cockroaches in a post-nuclear winter, the neighborhood’s only commercial survivors appear to be pawn shops, Dollar stores, and fast-food joints. One supermarket, a Minyard whose cinder-blocked and windowless façade is about as inviting as the entrance to Stalag 13, is the only retail food source in the several surrounding miles of food desert. But a lifeline from an unlikely source has been tossed Highland Hills’s way by a group of innovative academics. Paul Quinn College, a historically black college that sits just off Interstate 45 at the neighborhood’s eastern edge, is committed to lifting its neighboring community’s physical and economic health with a combination of food, farming, and servant leadership. There’s no little irony in this partnership. To drive by the Paul Quinn campus is to, well, keep on driving. There are no signature ivy-clad buildings or tree-shaded quads to invite college-shopping families for a leisurely tour. In fact, the first roadside buildings you see are in various states of demolition, reflecting, in part, the plunge in student enrollment from 600 to 100 (it’s now climbed back to 200) and the school’s loss of accreditation (it’s been able recently to earn back probationary status). At first glance anyway, and like the adjoining neighborhood it wants to help, Paul Quinn appears to be hanging on to life by no more than a pea tendril. But first glances are deceiving, and pea tendrils are stronger than they look. And when your back’s to the wall and nobody, even your own government, will help you, you fight like hell, you do the unexpected, and you take risks. In Paul Quinn’s case, not only did the college take risks, it committed a grievous sin, at least by Texas standards – they terminated their football program and turned their field into an organic farm. Yes, in the shadow of the Super Bowl, with the specter of Tom Landry looking down, and the holy glare of Friday night lights forever dimmed, Paul Quinn ripped up its sacred turf where football cleats once tread, and planted – goalpost to goalpost – peas, lettuce, carrots, strawberries, and more, lots more. While the roar from the football stands may have subsided, it doesn’t mean that the field has fallen silent. When Andrea Bithell, the farm manager, announced to student and staff volunteers that the kohlrabi had gone in last week, everyone cheered. Showing a group of farm visitors where the corn would be planted later this spring evoked a round of applause from several students who proclaimed their love of its sweet kernels. Indeed the competitive spirit and enthusiasm so much a part of college athletics is hardly lacking at “Food for Good Farm,” the name chosen to denote it’s larger mission of education, community service, and healthy food for all. Sounding more like a coach than a farmer, Andrea uses words like hustle to describe her student crew’s hectic effort to plant and seed the two-acre field. When the volunteers complained about working in the cold and the rain, they were reminded that football games are played in all kinds of weather. Even the plants are forced to compete in a set of 12 trial beds located in the field’s south end zone. Here students will test different growing methods and evaluate their potential financial rate of return. Elizabeth Wattley, Paul Quinn’s Director of Service Learning, proclaimed with pride that the farm’s tomatoes were better than anything she’d ever bought in a grocery store (she confessed that until her introduction to the farm during its first spring in 2010 she had been afraid of dirt). One student, biology major Symphonie Dawson, giggled when she described the farm’s mascot emblazoned on their t-shirts. “It’s the ‘Fighting Okra,’ an image of the vegetable wearing boxing gloves. We chose it because last year’s okra crop seemed to go on forever.” The “Rah-rah, Go Team, Go!” energy previously reserved for football games has been channeled into the end-zone to end-zone planting of 1,500 strawberry plants, 6,600 onions, a new asparagus bed, and dozens of varieties of vegetables. “The farm is the light of the college,” is the assertive way Elizabeth put it. The lack of farming experience or a farm background has not been a deterrent to anyone’s participation, including Paul Quinn’s President Michael J. Sorrell. With public policy and law degrees from Duke University, his stellar resume indicates he has represented American Airlines and Morgan Stanley, served on numerous prestigious commissions including an assignment at the White House, and was selected in 2009 as one of the 10 Best Historically Black College and University presidents. Notably lacking from Dr. Sorrell’s career synopsis, however, are any agricultural credentials, and ironically, his business achievements include representing top-flight athletes like Utah Jazz All-Star Deron Williams. So why did he eliminate the football program and then have the audacity to convert the field to a farm? A big part of the answer no doubt lies in his personal commitment to the concept of servant leadership, which, like the farm, he brought to Paul Quinn. With such simple but difficult to live by ideas like putting others before self, leaving the world a better place than you found it, and maintaining a spiritual faithfulness, Dr. Sorrell not only preaches what he practices (he personally teaches a freshman course in servant leadership), he practices what he preaches. And the farm is at the center of that practice. Isaiah 58: 9-12 gets prominent mention on the College’s website which also touts the school’s Christian underpinnings. The scripture admonishes us (some would say “teaches us”) “to pour yourself out for the hungry…then shall your light rise in the darkness…and you shall be like a watered garden.” Holding aside the self-interest in doing good (and why not? ), The Food for Good Farm has its heart and mind set on serving the hardscrabble community that surrounds it. Though a share of the harvest goes to the school’s cafeteria, 10 percent goes to a local food pantry, a sizeable share is also sold on a weekly basis to the community from the field’s former hot dog stand, and just to preserve some historical symmetry, the Dallas Cowboys buy a small share of the farm’s organic veggies, which, if sustained over time, will no doubt catapult “America’s Team” into a Super Bowl. None of this extraordinary progress has come cheaply. Elizabeth estimates that well over $100,000 in capital expenditures have been required to accomplish this conversion, and the on-going operating costs –Andrea is on the payroll half-time as is a variety of students who receive some compensation, especially during the summer season – are only marginally offset by farm sales. An upcoming April fundraiser featuring urban farming rock star Will Allen will hopefully swell the coffers sufficiently to enable the farm to buy its own tractor (it now pays for contract equipment services). But the rapid development of the farm and the rising fortunes of Paul Quinn College have come with a price – small or large depending on your perspective. The Good Food Farm is the result of a fifty/fifty partnership between the college and PepsiCo’s Food for Good Initiative. The college makes it clear that this is an equal partnership and that PepsiCo has not placed any strings on their giving. While Elizabeth acknowledges some inherent contradictions – yes, Pepsi and other soda manufacturers have contributed more than their fair share of calories to America’s obesity crisis – she feels their support has been entirely above board. Other than cleaning up its tarnished image, one cannot detect either covert or overt sinister motives in PepsiCo’s support. Yet, with 11 teaspoons of sugar in each 12 ounce can of Pepsi-Cola and their ferocious attempt over the years to hook children with their iconic brand, one can’t help but confront the ethical contradictions: where does the greater good lie, and when does one begin to slide down the slippery slope? Though the Bible offers little in the way of guidance when dealing with the PR strategies of modern corporations (obesity, for instance, having not appeared on the world stage for another 2000 years), the college might choose to at least make the topic grist for future classroom discussions. In the meantime, it’s hard to argue with the outcome of the Paul Quinn/PepsiCo partnership. Texas has one less football field and one more organic farm, clearly a net gain for humanity. Students from the captain of the basketball team to entering freshman are eating better, getting over their aversion to bugs, and getting their hands in the dirt (Symphonie noted that her nails look much healthier now that she regularly jams them into the soil). And the Highland Hills neighborhood is enjoying the health and aesthetic benefits of living adjacent to Dallas’s closest farm. Under Dr. Sorrell’s able leadership Paul Quinn is rising from the ashes, or should we say compost pile. Elizabeth and Andrea are guiding the growth of what would be considered an ambitious venture at a major university let alone a college as small as Paul Quinn. And the Fighting Okra, well, they just might be on their way to a national championship. Post originally posted at Beacon Broadside.